Bride and Groom | The leader in Ballroom dancing! Bride and Groom – The leader in Ballroom dancing! Don’t leave your first dance to chance. Be prepared! It’s fun and it’s easy! Take The Lead Ballroom can help you whether you are the “Last Minute Procrastinators” or planning the “Wedding Of The Century”! Beautiful smiles to finish off a perfect first dance as husband and wife. Are you getting married or know someone who is? Whether you’re planning a small intimate affair or a large gala, we can make your first dance as husband and wife an enjoyable, memorable experience. Leave your dancing to the professionals and take the pressure off of you. Your wedding dance is a statement about what you want to say to the people you care about. You decide if you want something simple or want your fantasy dance of a lifetime. It’s all about you! All we ask is that you bring your song and two smiles to the lesson. Schedule one lesson or take a package of lessons. The amount you choose is based upon your needs and desires. We will make you look the best you can possibly be out on the dance floor. Every Bride should get at least one under-arm-turn for her dance! We offer one hour of private lessons for $65 with an instructor. 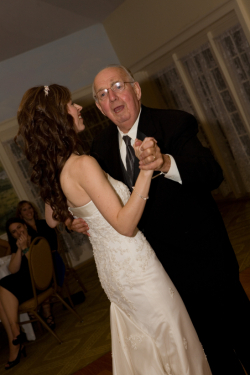 Bring in your wedding song and we will help you start making memories on the dance floor. BLOCK OF 4 SPECIAL – Most people find that one lesson is not enough. We also offer special Bride and Groom Packages to help you save some money. Our Block of 4 seems to be our most popular one. You get 4 one hour lessons which give you the basics and also gives you the time to polish and add the extra touches you want to make it special. We offer this for $240. BLOCK OF 10 SPECIAL – For the couple who are born extroverts we have the Block of 10 lessons. This actually gives you the most confidence because it lets the instructor work with you more to fix the little things that are giving you problems. We can customize things for you more such as openings in the music and ending, edits. It makes it very nice and memorable. 10 lessons for only $550.00. This is a steal actually. Dads – Don’t forget about your father/daughter dance! …..Hey Mom and Dad, you can get in on the fun too! Moms and Dads are welcome as well as the wedding party. Prices are adjusted per amount of people attending the lesson. Call for more details. All you have to do is call and ask for the “Wedding Special”. Tell em Susie sent ya! Frank and Kim dancing the Viennese Waltz for their first dance together to, “A Thousand Years”. ~ When should you start your lessons? It is recommended that you give yourself at least 6 weeks to learn your wedding dance. Can it be done in a shorter time span? Yes, anything is possible. Remember, a wedding can be stressful to plan and we want your dance to be a fun, memorable experience. The more time you give yourself to learn, the better it is for you and your Bride or Groom to be! Recommended attire: A leather soled shoe works best. Ladies, bring your wedding shoes if you have them. Dress in comfortable clothing and get ready to have fun! Also, remember to bring in your song! Private lessons are scheduled on an individual basis. We require a $15 deposit to hold your time for your lesson. There is also a 24-hour cancellation policy in order to not forfeit your scheduled lesson. Thank you for your understanding. Remember, it’s your first dance together as husband and wife. Make it memorable! Give the Bride & Groom a gift certificate for lessons! It is a gift they will appreciate and remember for years to come. (585) 503-7087 cell. (919) 578-2770 Google line.